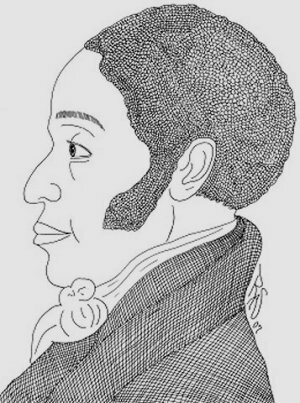 James Forten, who was born to free black parents, Thomas and Sarah Forten on September 2, 1766, became one of America's great civil rights* leaders. His great-grandfather had been brought to America as a slave, but his grandfather had obtained his freedom. James and his parents had always been free. He was transferred to a British prison ship called the Jersey where thousands of prisoners died in an epidemic. On the ship he befriended a white boy, Daniel Brewton. Once when Forten had a chance to escape he urged the man to take his friend Daniel, who was very ill. After seven months he was able to return to his home. He and Brewton remained lifelong friends. James only had about two years of schooling, but he read everything he could get his hands on and educated himself. In 1776 when James was only seven years old, his father died when he accidently fell into the Delaware River and drowned. Before his death he had worked for a sailmaker and had taught his son about the craft of making sails for ships. This knowledge was the reason he had a job on the ship during the war, and after the war was over he worked on a ship going to London. He worked in the shipyards there for a year. He then returned to Philadelphia in 1785 and started working as an apprentice* for Robert Bridges, the man who had employed his father. He was a hard worker, and after a time was put in charge as foreman over his white co-workers. Then he became a junior partner, and eventually bought the business after being employed there for thirteen years. Forten was a brave, caring person. Since his business was near the water, on at least twelve occasions he was able to save people from drowning. He prized a plaque given to him to honor his heroic deeds. He knew a lot about ships and sails, and he saw how improvements could be made. He is credited with inventing something to improve sailing. It was either a new kind of sail or a hand-cranked devise to make it easier to hoist* the ship's sails. It is said he became the leading sailmaker in Philadelphia and was one of the wealthiest African Americans living at that time. According to his will of 1830 he had amassed a fortune of $300,000. Translated into today's money, he was a millionaire. He used his money to help other people. He formed the Free African Society to help blacks when they were out of work or ill, and he helped to buy freedom for slaves. Many African Americans were fleeing to Philadelphia searching for freedom. There was a movement called The Society for the Colonization* of Free People of Color of America or the American Colonization Society. Their aim was to relocate the free blacks of America to Liberia in Africa. At first Forten favored the idea, but he realized the majority* of blacks were against it. In 1813 he wrote a pamphlet called Letters From a Man of Colour in which he urged free blacks to claim their rights to live as free citizens in America. 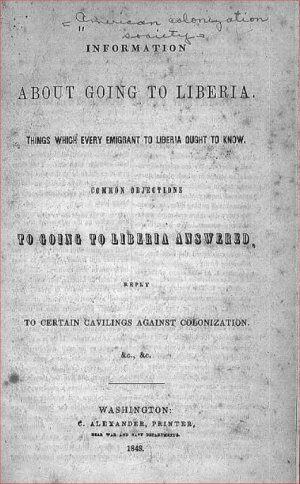 He continued to oppose the colonization movement, but many blacks over the next twenty years decided to move to the Liberia colony, and it later became an independent state. Forten married Charlote Vandine and they raised eight children. 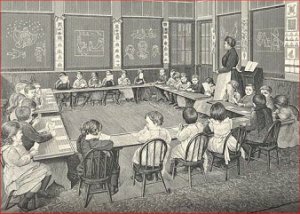 He could not enroll them in the white schools, so he hired tutors to educate them. Three of his daughters, Margaretta, Harriet, and Sarah, when they were adults, were active in the abolitionist* movement. He was a man of principle. He refused to help a slave trader. Once when a slave trader wanted to buy sails from him, he refused to do business with him. He bought several newspapers in order to publish his writings. One of them was called The Liberator which was run by an anti-slavery advocate,* William Lloyd Garrison. Many people came to love and honor him. At one time he opened his own home as a school for African American children. A Philadelphia school was named for him. James Forten died on March 4, 1842 at the age of seventy-six. Print Excerpts from "The Life of James Forten"
Read "Letters From a Man of Colour"
I like how it gave a lot of information about James Forten and very especific. I love the site. This page displayed 85,201 times.